My good friend, @trixiestix, got me the sprializer/slicer attachment for my KitchenAid stand mixer. I was thrilled because it was not something that I would have bought for myself. I've been trying it with several types of vegetables, and sweet potatoes have been my favorite so far. This recipe comes together quickly and is perfect for a weeknight meal. 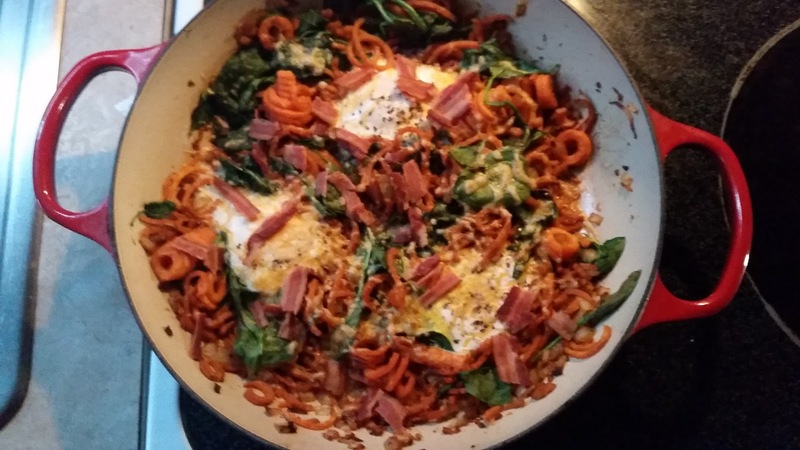 I spiralized the sweet potatoes over the weekend, and kept them refrigerated, which saved some time. 1. Heat 2 teaspoons olive oil over medium-high heat. Add onions and saute for 3-5 minutes, until just starting to brown. Add garlic and cook for 30 seconds. Sprinkle with salt and pepper. 2. Add the remaining teaspoon of olive oil. Add the sweet potatoes, paprika, red pepper flakes, and thyme. Sprinkle with salt and pepper. Cook for 7 minutes, stirring occasionally. If the bottom of the pan becomes too dark, add a few tablespoons of water and scrape the bottom of the pan. 3. Stir in the spinach until wilted. 4. Heat the oven broiler to high. In the skilled, separate the mixture into 3 mounds. Make a well in the center of each mound and crack an egg in each well. Sprinkle each egg with salt and pepper. Add the cheese. 5. Broil for two minutes or until the egg whites are set. Sprinkle with the chopped bacon.